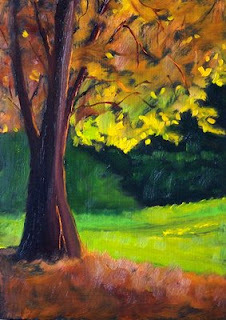 The recent arrival of sunshine inspired creation of this 8x10 inch oil painting. It has been a pleasure the past few days to take an evening walk and enjoy the warmth of sunshine. As the sun drops lower in the sky, it brightens the vegetation and creates delightful shadows. When this painting dries, it will be placed for sale at Impressions Gallery at 1000 Markets. This week, 1000 Markets has quietly dropped the Sneak Preview phase of its development. The new categories and an improved search engine provide several reasons for both buyers and sellers to celebrate. 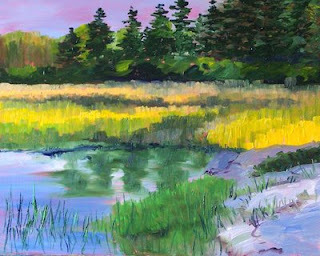 With excitement over the new change and additional features, I am happy to add a new landscape oil painting to Impressions Gallery at 1000 Markets. This painting will be part of several markets including the Artists Collective and the Pacific Northwest Market. The painting is 8x10 inches on a gessoed MDF panel and is available for $125.00 plus $12.50 for shipping to US addresses. Visit here for more detail and purchase information. 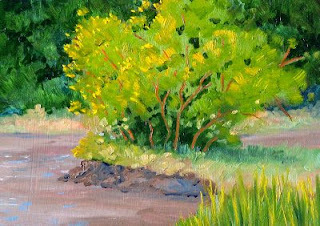 This little 5x7 inch oil painting was inspired by a place I often walk near the Chambers Bay Golf Course in University Place, Washington. There is a series of trails that meander above, around, and through the golf course. The Soundview Trail, Grandview Trail, and 64th Street trail are interconnected and are a delight to traverse. 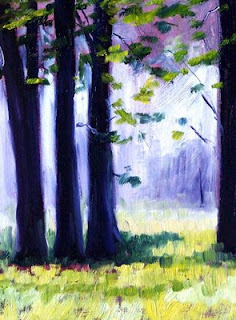 This painting develped from a foggy morning tour beginning at the 64th Street Trail. The Pierce County Environmental Services Building hosts a line of trees whose trunks stood out dark and proud in the coolness of the foggy morning on which I visited. When it is dry, I will list this painting for sale in my Etsy Gallery with my other small tree paintings. 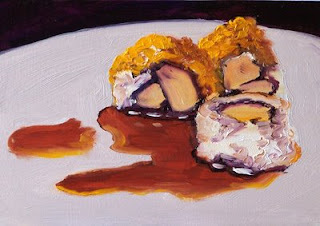 The paint on my little sushi painting is finally dry. The impasto required a little more drying time than some of my other paintings. The painting is 5x7 inches on a gessoed hardboard panel. It is for sale in my Etsy Gallery for $50.00 plus $6.50 shipping to US addresses. Click here for thumbnail closeups of the paint and textures. 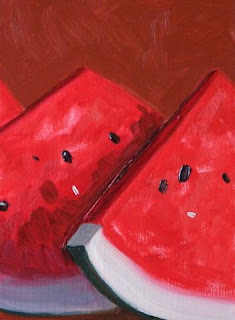 Other small still life paintings are availabel here. I have looked at the reference for this Different Strokes Challenge painting for over two weeks. Figure painting is not a skill that I'm comfortable with. Proportions and values are king. Off just a bit and the figure looks deformed. Incorrect values and the figure looks flat rather than dimensional. I know this is what a challenge is all about, but my strength sometimes falters. Today, with gritted teeth, I finally jumped in and took the challenge. Now that I've finished, I'm glad I did it. I'll look forward to the next challenge. At least my version looks similar to the marble statue it was intended to represent. My version is 5x7 inches, oil, on hardboard panel. Other challenge entries can be found here. 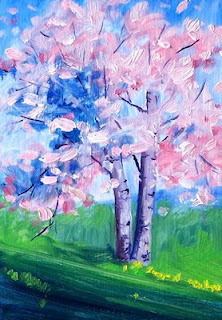 The cherry blossoms are out and I couldn't help but take a few moments to paint this little tree. It won't be long until the blooms fade and fall. When the cherry trees bloom, it is a signal that I should start planting my garden and breathing fresh air. 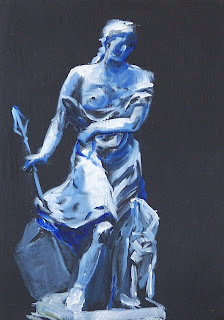 This painting is 5x7 inches on a gessoed hardboard panel. For the first time, one of my small paintings has made the front page at Etsy. The front page was currated by Flandersfield with a theme of EtsyRain Springtime in Seattle. If you hurry, you can catch a glimpse of the entire collection before it expires tomorrow. The collection is a lovely compilation of soothing green items that celebrate the mood of a Pacific Northwest springtime. The 5x7 inch oil paintings was created on a 1/4-inch gessoed hardboard panel and was inspired by a clump of trees on the Nisqually Delta of Washington State. It can be purchased for $50.00 plus $6.50 for shipping to US addresses. Purchase details are available here. 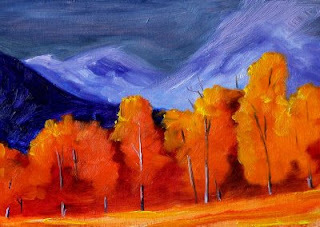 My Etsy Gallery has other small tree paintings, small paintings of fields , and mountains. I'd love to have you visit. 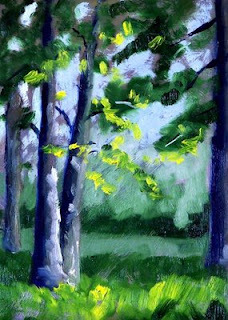 This is another of my 5x7 inch backlit tree paintings. I've enjoyed painting these sunny little landscapes. It was created on a black gessoed panel with professional grade oil paints. When it is dry it will join my other small format oil paintings in my Etsy Gallery. Capturing a backlit tree can be a challenge, but the difficulty was eased by beginning with a black gessoed surface. 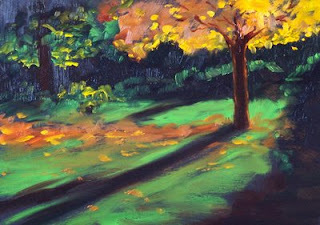 This painting is 5x7 inches on a black surface and dipicts the shadows of an evening in early autumn. Leaves on the maple are turning a golden color and settling on the grass. When the painting is dry, I will list it for sale in my Etsy Gallery along with other small tree paintings. The paint is finally dry and this little 5x7 inch oil painting is up for sale. I've enjoyed my daily view of this cheerful reminder of summer's approach, but it is time to say good-bye to my little friend. This painting is available in my Etsy Gallery for $50.00 plus $6.50 for shipping to US addresses. Click here for more detail about shipping and terms. Although it seems like I have been stretching canvas and applying gesso like made recently, when I set up for painting this morning, I didn't have any white gessoed hardboard panels ready to go. There were a number of black gessoed panels, but no white. Finding myself in such a predicament, I decided to work on the black panels, something I haven't done for a while. This little 5x7 inch oil painting soon emerged. It was fun to paint even though yellow always presents a challenge. When it is dry, I will place it for sale in my Etsy Gallery along with some of my other small fruit and vegetable paintings. 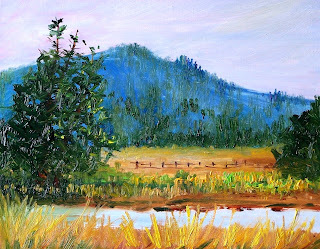 This morning I was inspired to paint a scene I pass often when travelling to the Washington coast. From a portion of Highway 101 where it passes through Gray's Harbor County, this little pond always catches my attention. I don't know if it has a name, but it is surrounded by pastureland and has a peacefulness that seems out of place next to a busy highway. The painting is 8x10 inches on a gessoed hardboard panel. Today's painting was created in response to the Wetcanvas April Lanscape Challenge. At the beginning of the month three photos are posted and forum readers create their version of any or all of the selected photos, posting them in the thread. I was very pleased to see a Washington State River, the Wenatchee River ,was a choice for one of this month's photos. 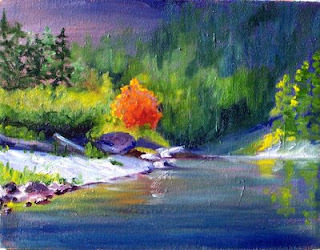 This painting is a 9x12 inch oil painting on a recycled, hand-stretched canvas. I love canvases that I stretch myself. The stretcher bars are sturdy and the canvas is heavy, much better than most ready-made surfaces. There was apainting I didn't like on this canvas, but because of the amount of work entailed in tearing the canvas off and restretchung with new canvas, I just painted over it. The previous layer of paint provided a great underpainting and the texture interesting. I'm pleased with the results. 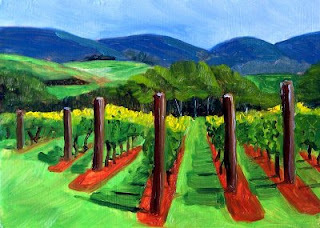 When it is dry, I will paint the 1-1/2 inch sides and list it for sale in my 1000 Markets gallery, Impressions Gallery. 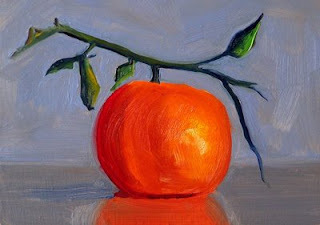 Last winter, during the holiday season, when tangerines were in season, I painted this little gem. It is a 5x7 inch oil painting that brought cheer to my studio in the midst of the winter dreariness. I've just listed it in my Etsy Gallery and it can be purchased here for $50.00 plus $6.50 for shipping to US addresses. This painting is small and will easily fit in a standard frame. It was so much fun that I painted a second version in an 11x14 inch format on stretched gallery-wrapped canvas. The larger version of the painting is for sale in my Impressions Gallery at 1000 Markets. For a number of reasons, I have decided that my little 5x7 paintings will remain an exclusive item in my Etsy Gallery and my larger paintings will be listed at in the Pacific Northwest Market or Artists Collective at 1000 Markets. More small still life oil paintings are available in the Fruits and Vegetables Section of my Etsy Gallery. Larger still life paintings are available in the Still Life Section of Impressions Gallery at 1000 Markets. This little 5x7 inch oil painting just moved to the front of the line in my Etsy Gallery. You can purchase it for $50.00 plus $6.50 for shipping to US addresses. Closeups and purchase information of this small format oil painting is here. After painting the hills of California, I am really ready for some warm weather. But, Western Washington is still spitting out threats of winter. Snow showers are predicted tonight and tomorrow. I've lived in Western Washington most of my life and I've never heard a prediction of snow in April. Thus, I'm warming up my world by listing this little warm-weather 5x7 inch landscape oil painting in my Etsy Gallery. It can be purchased for $50.00 plus $6.50 shipping to US addresses by clicking here. Today I finally satisfied my need to paint something a little larger and work on canvas. This 16x20 inch oil painting was created from the Wetcanvas April Landscape Challenge. 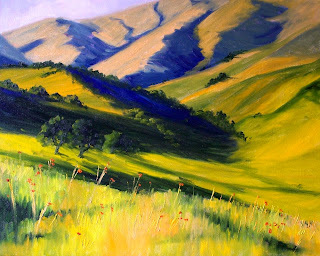 What I liked about the reference source for this painting was the movement created by the lines of the sunshine and shadows on the undulating hills. 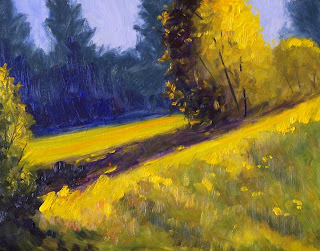 I used a palette of Naples Yellow, Cadmium Yellow, Cadmium Yellow Light, Cadmium Lemon Yellow, Sap Green, Ultramarine Blue, and just a touch of Cadmium Orange in the foreground wildflowers. Contact me if you are interested in purchasing this painting. After a few days of brilliant sunshine, we are back to the gray, damp weather of an early Washington State spring. This 5x7 inch oil painting captures the coolness with only a touch of spring green that is typical of spring time in the Pacific Northwest. Eventually I will place this small format landacape in my Etsy Gallery along with today's listing. The weather was sunny today, so I felt motivated to publish a sunny little painting. This one is a 5x7 inch original oil painting. Yellow items can be a challenge to paint, but I was satisfied with the results of this effort. 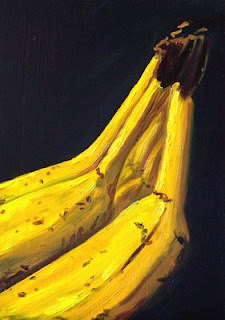 Cadmium yellow provided the sunlit surface of the bananas and yellow ochre worked well as the shadowed side. This painting is for sale in my Etsy Gallery for $50.00 plus $6.50 for shipping to US addresses. Other small still life paintings that provide good companions for this painting are available in the Fruits and Vegetables Section of my Etsy Gallery. 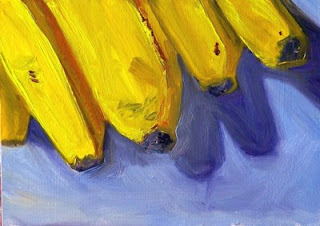 Click here to purchase the bananas or here to see other small still life paintings. I'm home from the coast with so much to do! My blog hasn't been updated for a week, my Etsy Gallery needs attention, and I need to mail several paintings to their new owners. It is so fun to vacation, but my chores have fallen behind. This little 5x7 painting is part of my effort to get caught up. I renewed it tonight in my Etsy Gallery and it can be purchased for $50.00 plus $6.50 for shipping to US addresses. It is one of the few left from my Summer Fruit series. 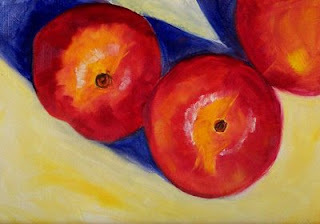 When the nectarines were ripe, I couldn't resist setting them on my studio table and capturing their brilliant color. In a few months a new crop will be ripening and the memory of their delicious summer appearance will be remembered whenever I look at this painting. Click here for a link to purchase.